Look at the picture below. Which of these people look confident to you? Go on, guess! You can find the answers at the end of this post. Can you guess which of these are power poses? We just looked at a series of postures. Do you think the people who are sitting scrunched in their chairs were confident? OR the ones who are more open with taking up more space around them? People with a more open body language are the confident ones. The posture is called a power pose. 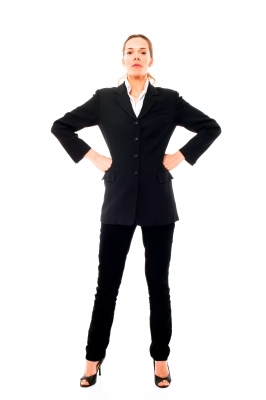 A power pose is an expansive, confident body posture that makes us feel confident. Open your arms to claim more space, puff up your chest, look into the eyes of others, raise your chin up and plant your legs apart. You just learnt to do one of the powerful poses. Research has now proved that our body language can have more impact on our mental and physical confidence than was believed so far. If you guessed the answers to the above quiz right, you will know that we tend to open up when we feel confident and slouch and close up when feeling low. The way we feel mirrors in our body language. What’s new about power pose? So, the way we feel is mirrored in our body language and we should watch it – what’s new about it! We all know that. But it was a revelation to know that assuming the power pose just for 2 minutes before an important event can actually make you feel confident and perform a lot better. It’s not just about how we open our arms, push out our chest and part our legs. It’s a lot deeper. Power posing boosts testosterone, the feel good hormone and lowers, cortisol, the stress hormone. And this automatically boosts confidence and reduces stress. Why is power pose useful? Remember the time we are gearing up for an important presentation? Hearts racing, palms sweating, we instruct our mind to calm down. But guess what! Go to the loo and power pose for 2 minutes, tell yourself to get excited (instead of calm down) and you are likely to feel more confident and do well in your meeting. How great is that! When I read about the power pose and thought about it, I realised that men usually and naturally have a power pose. Even Amy Cuddy (who’s video we will watch on this blog later this week) says, “Women feel chronically less powerful than men”. Women are more prone to a closed body language. Even though, I feel, they are the ones who need to project more power and hence assume the pose more often. The power pose is a classic example of how not just our thoughts that impact body language but it can be the other way round too – our body language can influence the way we think. This is a precursor to the next post where I will talk about the insightful TED talk by Amy Cuddy, the social psychologist and Associate Professor at Harvard, who shares her research about body language and the difference power posing can make to how one feels. Meanwhile, there are a few interesting articles you can read and start applying in your everyday life. Watch this space for more!